No Child at Definition Theatre Company directed by Chika Ike takes an uncomfortable and hilarious dive into the inner workings of arts education in public schools. Nilaja Sun’s play investigates the disparities in our current school systems and its effect on both teachers and students with searing wit and no shortage of laughs. The audience is introduced to the school and its history by the dynamic and talented janitor, played with gusto by debrah kneal. We learn that this neighborhood in the Bronx used to be primarily Italian, and that kneal’s character was the first Black janitor in the school until the 60s and 70s when Puerto Rican and Black residents moved into the neighborhood. This shift spurred the name change to Malcolm X High, and the school began to face neglect from the state the current state of disrepair in which the school consistently finds itself. This is no surprise to anyone working in education. When the students are low-income and/or Black and Brown, funding dries up and so do creative approaches to education. Education becomes about test scores and discipline, rather than critical thinking and opening doors for students. Enter the teaching artists, the last bastion of hope for intimacy and liberation in a child’s education, or so No Child would have you believe. The classroom teacher is the beleaguered Miss Tam, played with a hilarious nervousness by Kirsten Chan. She starts off by giving the guest teaching artist gives Miss Sun, a glowing Adia Alli, a quick run down of the class, letting her know the students will probably be very very late, skip the class, and not be very nice to her and she quickly makes her exit. 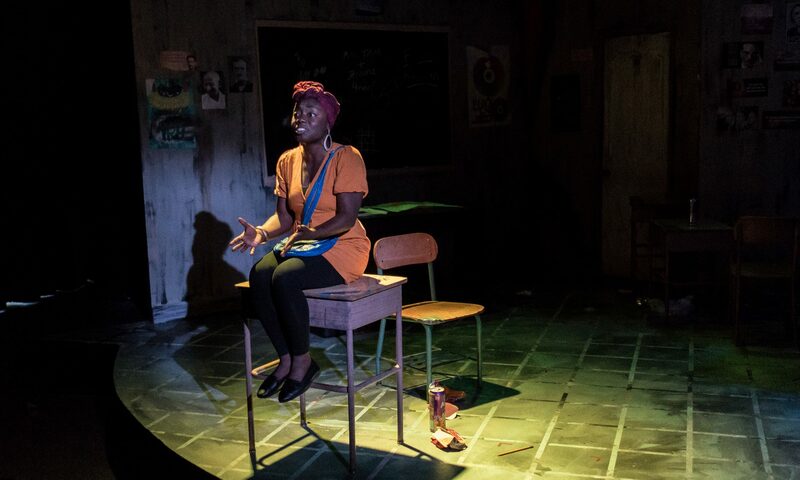 If the dilapidated classroom filled with posters and graffiti designed to impressive specificity by Therese Richie is any indication, things are not going to be easy for Miss Sun. The class of students themselves are played by three actors, Victor Musoni, Netta Walker, and Lawren Carter. Walker was recently seen doing a fabulous turn as Ophelia in Hamlet and it is a treat to see her put her skills toward comedy in some of the bawdier roles she took on during this show. To my own detriment, I had not seen Carter perform before but their character work and comedic timing shows they are one to watch. Victor Musoni, an alumni of The Yard is, as always, The Truth. The Truth: “Someone who lives up to and beyond the hype.” Mark my words that he will be amongst the Greats of Chicago actors someday. This ensemble deserve tremendous praise under Chika Ike’s direction. You may notice there are three students and they play multiple roles, this is the only bit of the script and/or directing that was somewhat confusing, solely because of the way the lines were structured. As scenes went on I was able to grasp through the actors’ physicality when they were playing a different student, but they each had about three or four roles to contend with in any given scene. Sometimes different character lines for the same actor seemed to come right after one another. I mention this in such detail now so that you know this is the convention and to look for these physical choices early on as it will help you relax and enjoy the show sooner. The actors make it work because they are brilliant, but the audience shouldn’t have to work quite so hard to latch on to the emotional journey of these students who are so crucial to the story. Kirsten Chan’s interpretation of several educators that pass through this school system is worth noting as well, each of these educators are severe or lacking in their own way, but for distinctly human reasons. A beautiful moment in the show is when a conversation occurs between Miss Sun and the Principal, where neither person shares space with the other, rather it is communicated through Slick Jorgenson and Kevin Pelz’s lighting isolations. These lighting tricks take us all the way to the subway, in a creative use of the upstairs Victory Gardens space. Ike’s directing is interesting because even in a play about the most real of circumstances, she manages to create stage magic. The use of the voms, as well as a creative depiction o going through a metal detector, all show this director’s signature style. No Child is an inspiring, thoughtful, and fun show put on by one of Chicago’s brightest emerging companies. I commend Definition for working with so many Black directors in their seasons, both emerging and established. Definition is not just producing hits, they are also taking risks, and getting better every day at marrying the two.